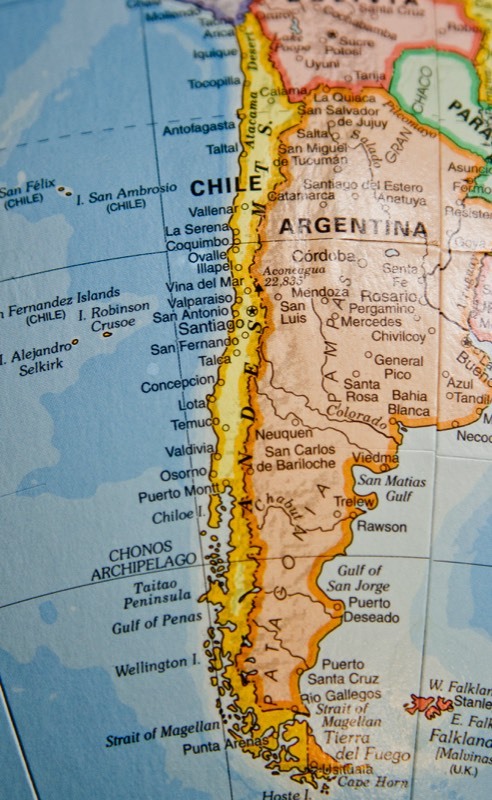 Very much an anomaly in the wilds of South America, Chile is a prosperous and forward thinking nation that today holds free trade agreements with the European Union, the United States, Canada and South Korea. For years known as "The jaguar of the Latin America" Chile has developed a diverse economy based on mining, forestry, seafood, agriculture, wine and tourism. You may ask yourself: How has such a seemingly 'string bean' of a land of barely 17 million people attracted such interest commerce from so many nations so far away? Just imagine yourself a country that is 4337 km long and no wider than 400km in any place, full of diverse super natural geography. The Atacama Desert(driest in the world) to the North, a fertile central valley(bread, fruit, vegetable & wine basket of Chile), A lake district the length of Sweden to the South along with the wilds of Patagonia an area filled with mountains, volcanos and vast rivers. Even further to the South for the extreme adventurer theres the uncharted wonders of Antarctica. To the West the boarder is made up of the worlds longest mountain chain the Andes Mountains. All squeezed into a narrow strip between the heights of the Andes and the Pacific Ocean. There's only one way to see this all for yourself and thats to come on down!